There are over 400 Million people on earth with a Facebook Account. From this point of view it makes absolute sense to offer a Single Sign-On with Facebook. 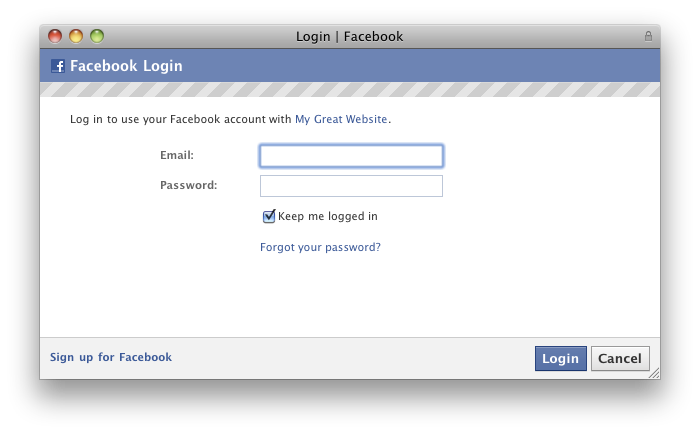 Facebook offers a Login via OAuth 2.0. The Facebook documentation for the Authentication process you can find here: http://developers.facebook.com/docs/authentication/. Just replace “111111111111” with your client_id and “yourdomain” with your domain. The link contains a redirect_uri on your server. After the Facebook Authentication is done, Facebook will redirect the user to your “redirect_uri”. OK. And here is the corresponding Controller with Ruby on Rails. Together with the given token, your client_id and your client_secret you can fetch an access_token from facebooks GRAPH API. With the access_token you can fetch a user as JSON object.